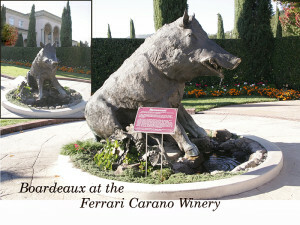 “Boardeaux” is the name given to this sculpture by the Ferrari-Carano Winery in Healdsburg after they commissioned the larger than life sculpture of the boar as a surprise for Don Carano’s 70th birthday. There, “Bordeaux” sits in a pond and is plumbed as a fountain with water coming from his mouth. 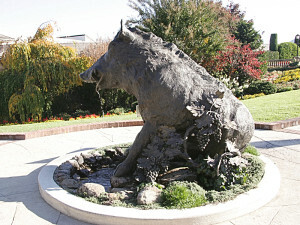 The name is a play on words, the French red wine Bordeaux, and Boar. In Florence, Italy, there is a famouse bronze boar in a pond in the square where passersby have rubbed the nose for good luck leaving it shiny. The same is true of Bordeaux. The life-size piece is great for your garden, near your grape vines, or any outdoor landscaping, and the maquette (see Sculptures) is a perfect size to display in your wine cellar.